I actually use this as an indoor rug with a shag rug on top of it. It is beautiful but rough under the feet. I like the two rug look in our formal room. We've had for about a year and has not lost its shape. Came a little greener than expected but lightened in color over time. 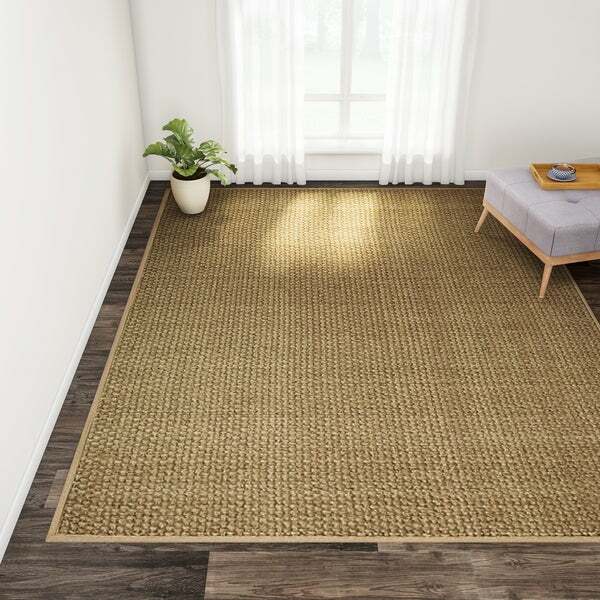 Turn any living space into a stylish beach home with the organic beauty of this 8' x 10' seagrass rug from Safavieh's Natural Fiber Collection. Bordered in beige cotton twill, this rug's clean, neutral pigments and elegant basketweave design allow for unlimited decorating versatility. Dimensions 8 ft. x 10 ft. It's a great price for a rug at this quality that covers as much floor space as it does. I'm using it under a huge dinning room table and chair set on top of a cold tile floor. The rug really warms up the space with the natural fibers and truly does tie the room together. Only negative, as one would expect, the beige colored border easily shows dirt. I recently had about forty people over for a Super Bowl party and now need to clean the border. If you're placing it in a high traffic area, I may recommend the brown border version. I bought this rug for my living room. It arrived true to color and in good condition. As always, it was shipped and arrived very quickly from Overstock. Seagrass is durable and is relatively smooth underfoot, so it is a good fit for a living room. The rug does not have a latex backing. It has a felt backing that makes the rugs feel light and cheapens the quality. You MUST have a rug pad for this rug. Overall for the price, I give it 4 stars. It looks great and brings the room together. I have small kids and didn't want to spend a fortune on a rug. I love this Seagrass rug! I am using it in my dining room, under the table. Shows no signs of wear and tear. Large enough for the chairs to stay on the rug when they are pulled away from the table. My entryway is adjacent to the dining room, and I also purchased the Safavieh Casual Natural Fiber Hand-Woven Sisal Natural / Beige Seagrass Runner - 2'6" x 6' to match it. Another quality Safavieh home accent. This rug is going under my dining table and chairs to complement the updated traditional style I'm creating. The rug does not necessarily need a nonskid pad. The backing keeps it in place for my purposes. 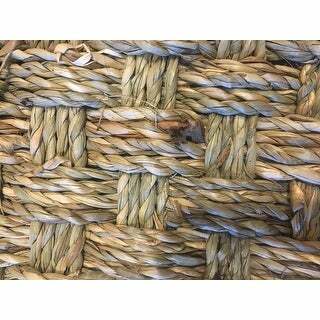 The texture is smoother than sisal and the color is natural beige with hint of green tones. Very relaxing. The faint smell is like tea and I hope it lasts, it's like aromatherapy to me. I was concerned it would be green as others reviewed and rolled up it did have a green hue. However, it was very minor and fades because this is seagrass. I ordered in 3 sizes to accommodate an open floor plan and help it flow. Wish we could add pictures, all three rooms are different in their own way but beautiful with this rug because it goes with any decor. The weave is tight enough that dining chairs easily slide in and out without damaging the weave. The border is light and although it seemed to get dirty fast I found that wiping with a dry cloth knocked off most of the dirt. We do have a dog and had a party after adding the rugs...they still look great. 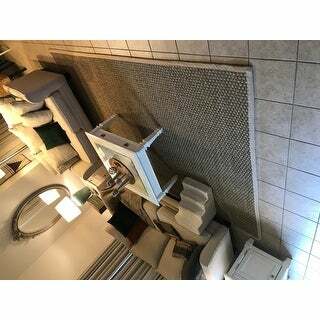 In two rooms I added smaller rugs (5x8 over 9x12 and 3x5 over 5x8) to layer over these to add dimension and texture. Definitely recommend this rug!! I also liked the subtle chevron pattern but it wasn't available in all sizes I needed. I saw one in person and it subtle enough that it will bear the test of time. Our local carpet store custom makes these and it would have been $400 more had I gone through them. Using my O Rewards, taking advantage of an Overstock sale weekend I really saved. I also called Overstock since it was my birthday month and although they don't have a birthday promo program he offered 10% off which was nice but less than the 12% they already had going. Customer service also helped me find a bulk purchase coupon. Gotta love Overstock!! 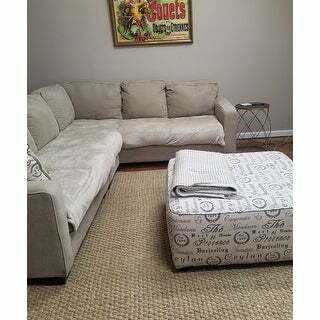 This great grass rug was purchased for a family room area. It is thick, well made and has a nice pattern. 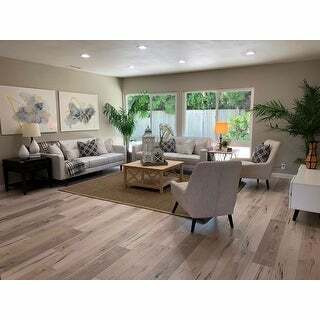 It has a neutral and very natural looking color and would fit well in many different decors. Bought this rug to go in my dining room. It was delivered quickly and looked just like the picture. It's very thick and seems well made. One small area of the binding was loose but not noticeable. It's perfect and what I expected. My only complaint would be that it is very rough because of the natural seagrass fiber so it doesn't feel so go to walk on it with bare feet. Other than that I am extremely please and would order this rug again. Love my purchase of Beige Border Seagrass Rug. It completes the room. 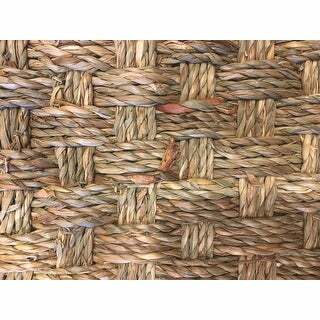 This is the second Safavieh seagrass rug I have ordered from Overstock. I liked the look of the first one so much, I bought another one for my dining room. The rug is a nice color and the beige binding goes well with the overall look of casual elegance. While I do not think a young child would appreciate playing on the rug, it is not uncomfortable to walk on with bare feet. I I had the right room, I would buy another one! Low price but his rug is poor quality sea grass. No backing and lumpy and extremely coarse to walk on. I've had sea grass rugs for years and this just doesn't measure up. I wanted a low maintenance, affordable rug for my dinning room and I feel like I nailed it with this! It is a lovely light color. The border gets dirty when people walk on it, but don't be concerned because it vacuums right up. My dog has even left a muddy paw print on the khaki border and it came right up with the vacuum (I let the mud dry first). You will not regret buying this. It gives the room a warm feeling. Just love it! Great rug. Showing a bit of wear already, but is in a heavy trafficked area. exactly as expected. Just like picture. Arrived quickly. Nice quality and sturdy material but light enough to where I could carry the whole rug myself up a flight of stairs. Would buy again. This rug compliments my “farmhouse” style decor. The woven details are so beautiful and it seems sturdy so it will withstand the wear and tear that children can leave on furniture. I love this rug! It is thick and has nice braids to it. It adds great texture to the space I Staged and is very large at 8 x 10... I like the bordered edge- this is a great rug if you’re looking for texture. Exactly what we were looking for. The rug came rolled and easy to lay out flat without creases. There was no scent as some reviewers mentioned. Obviously feels different with bare feet than traditional rugs but isn't uncomfortable. "What is price 9x12 and 10x14? Thanks "
"How much does this rug weigh?i want to ship to Arizona and need the weight thanks"
"How wide is the border on this rug?" "Is the color a brownish beige or creamy beige? It looks one color in one of the pictures and lighter in the other. Thanks!" It appears to be more of a creamy beige. Please note that some colors may vary due to dye lot variation from production. "This rug arrived with very crooked edges. How can I fix this?" "Can you use this rug outdoors in a covered area?" Yes, I use mine in my pool house. It has water on it all the time from swimmers. Still looks like new and has held up very well under the constant dampness. I bought this rug for our screened porch and love it. I have used it all summer with no problems and I live in the very humid south! "How easy is it to vacuum? Does dirt/lint/crumbs get caught in the weave?" This rug can be vacuumed to keep it clean, however we advise against over-vacuuming any of our rugs. Easy to vacuum. I turn off the beater bar and just use the suction. So far (after 4 months) I have not noticed anything getting caught in the weave. It's pretty tight. At first it had some random fibers sticking out of the weave but I just snipped them off. Do not try to pull them out.